Tue., April 24, 2018, 11:28 a.m.
DB Saivion Smith. The junior college transfer, a former five-star LSU signee, could make an immediate impact in a secondary short on experience. The Tide must replace its entire starting secondary, including unanimous All-American Minkah Fitzpatrick, plus a key reserve. LB Randy Ramsey. The 6-foot-4, 227-pound Ramsey has shown flashes of All-SEC potential during his first three seasons at Arkansas, but he’s also struggled with inconsistent stretches. Now entering his senior season, Ramsey had the best spring of his career under new coach Chad Morris and is expected to build on his 42-tackle performance last season. DL Nick Coe. The versatile third-year sophomore is listed as a backup defensive end behind Marlon Davidson but could play multiple spots. The 6-foot-5, 270-pounder, who had two sacks last season, was the defensive MVP of Auburn’s spring game with a sack for a safety. WR Van Jefferson. The 6-foot-2 receiver was the team’s top playmaker during spring practice, running by cornerbacks, leaping over safeties and making quarterbacks Feleipe Franks and Kyle Trask look better than ever. Now, the Gators will wait and see if Jefferson will be eligible this fall. Jefferson and other former Mississippi teammates have petitioned the NCAA to play immediately following coach Hugh Freeze’s ouster amid an NCAA investigation. RB D’Andre Swift. 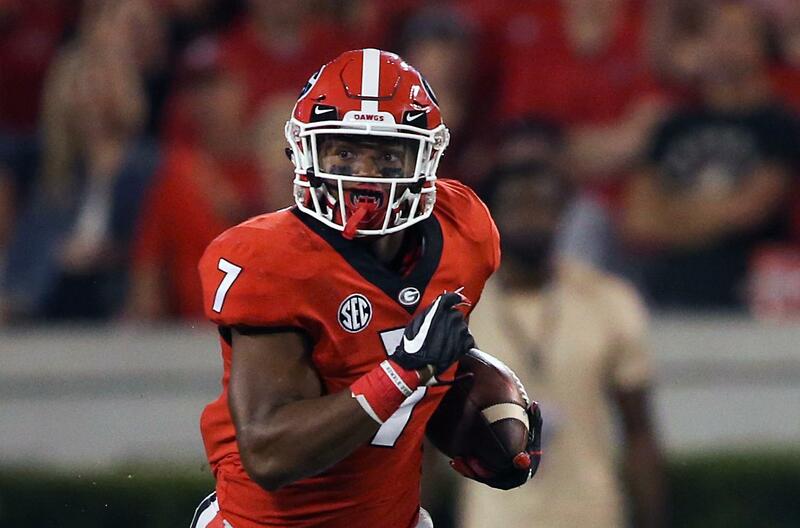 While playing behind seniors Nick Chubb and Sony Michel, Swift was Georgia’s third-leading rusher with 618 yards and fourth on the team with 17 catches (more than Chubb and Michel combined) for 153 yards. He led the team with 88 yards rushing and a touchdown in an SEC championship game win over Auburn. RB A.J. Rose. The Wildcats hope Rose can complement two-time, 1,000-yard rusher Benny Snell in the backfield next season. Rose, a redshirt sophomore, rushed just 15 times for 37 yards last season but showed big-play potential with 134 yards and three touchdowns in the spring game. WR Justin Jefferson. The younger brother of former LSU QB Jordan Jefferson and DB Rickey Jefferson caught a 94-yard touchdown pass during the spring game and may have played himself into a bigger role next fall. LB Detric Bing-Dukes. Linebacker has been a big problem for Ole Miss the past few seasons and the Rebels are still searching for solutions. Coaches praised Bing-Dukes as a leader throughout the spring. The 6-foot-1, 254-pound senior had 24 tackles last season and will need to be much more productive next fall. WR Austin Williams. The 6-foot-3, 205-pound Williams caught four passes for 61 yards and a touchdown during Mississippi State’s spring game, capping off an impressive stretch of practices. The redshirt freshman could provide an immediate upgrade for the Bulldogs, who sometimes struggled to gain big chunks of yards through the air last season. WR Nate Brown. The senior has battled injuries since emerging as one of Missouri’s top receiving threats as a sophomore during the 2015 season. However, the 6-foot-3, 210-pound Brown was healthy during the spring and showed the potential to become a top target for quarterback Drew Lock this fall. RB Ty’son Williams. The North Carolina transfer debuted for South Carolina last fall, but often struggled to find running room. Still, he finished second on the team with 471 yards. The 6-foot Williams had a strong spring, an encouraging sign that he’ll be able to improve on those numbers this fall. DE Kyle Phillips. The former five-star recruit heads into his senior season with only three career sacks. Injuries limited him early in his career. He played all 12 games last season and made seven starts but had just 4 1/2 tackles for loss and two sacks. But there’s reason to believe the son of Tennessee State athletic director Teresa Phillips could deliver a breakthrough in his final season of eligibility with Tennessee’s switch to a 3-4 scheme under new coach and former Alabama defensive coordinator Jeremy Pruitt. TE Jace Sternberger. The junior college transfer had eight catches for 147 yards and two touchdowns in the spring game. That kind of production would be a welcome change for the Aggies, who didn’t get much production from the tight end spot last year. RBs Ke’Shawn Vaughn and Jamauri Wakefield. The Commodores and coach Derek Mason have to replace the school’s all-time leading rusher in Ralph Webb. Luckily, he has some intriguing candidates for the job at what might be the deepest area on the team. Vaughn sat out last season as a transfer from Illinois, while Wakefield now is a sophomore. Published: April 24, 2018, 11:28 a.m.